Samlerhuset partners with Pistrucci for a remarkable re-design of the Sovereign - Samlerhuset Group B.V.
To celebrate the 200th anniversary of the world’s most famous gold coin design, Saint George and the Dragon, Samlerhuset subsidiary The London Mint Office launched a classical masterpiece; reborn and redesigned by a family member of the original designer of the modern sovereign. With only a few exceptions, many modern sovereigns struck since 1817 have featured a depiction of Saint George slaying the dragon. Renowned Italian sculptor and engraver Benedetto Pistrucci (1783-1855), who was the Chief Medallist for The Royal Mint, first created this now iconic and world famous design. To commemorate 200 years of Benedetto’s design, The London Mint Office commissioned his great, great, great grandniece, Angela Pistrucci, to recreate the image of this ancient story in a contemporary style. As an acclaimed artist herself, she created a coin which expertly reflects the legacy of her ancestor’s seminal work whilst also drawing on early depictions of Saint George, recasting Benedetto’s Greek saint as a Roman soldier. 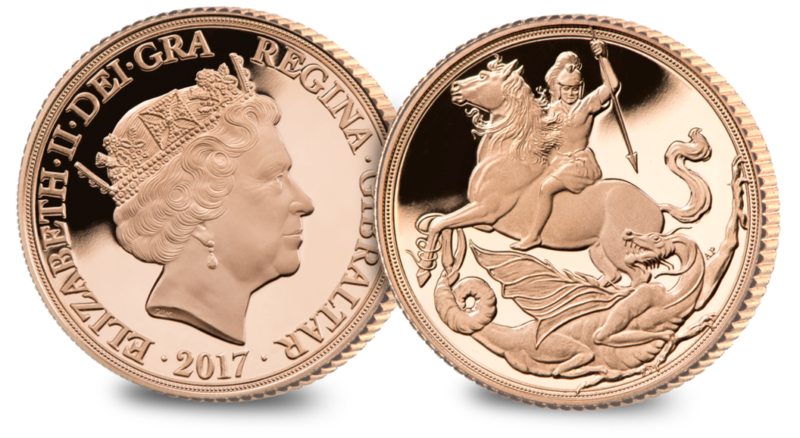 Commenting on the exclusive new coin, Dan Penney, Senior Creative Manager for The London Mint Office said: “It is very much its own coin; the position of Saint George and his horse to face left brings balance to the composition and the dragon climbing up the side adds interest and movement while making excellent use of the shape of the coin. Issued by the Government of Gibraltar, our 2017 sovereign is undoubtedly a new Pistrucci masterpiece”.